I've wanted to do this for a while, and finally did it! A manual control of the radiator fan, nothing new, but I didn't find any "good" DIY for it... I'll do my best. I wanted it to be plug and play, without messing any original part, and without any soldering inside the car. They are the thickest I found. And you'll need a soldering iron (the 18w one at Home Depot is pretty good), heat shrink and solder. What we want is a mean to ground the pin 85 of the 4 fan relays manually. This is done with the three positions switch, one position for low, one position for high, and the middle position is off. The PCM still controls the fans, and even if you forget to turn the fans off, they will shut off when you turn the key off after 5sec. You can do the ghetto version by simply wrapping a wire around the pin directly on the relay... but I don't like it! I measured 11.5A at high speed and 7.8A at low speed when the car is stationary. 14AWG should be alright for that. The relay are positioned like this from right to left: [low speed right] [high speed right] [low speed left] [high speed left]. I replaced the wires going to the pins 87 and 30 with the 14AWG wire since the are the power wires, the other are only for control (low current). I'll draw a clear schematic after... pictures are pretty useless here. I haven't put the final assembly in the car yet. Hey, careful with that last hosting site, I don't know if i clicked something by accident, but its got some security issues. Great job! I really like that it is fully reversible, I might do this over the summer. To clarify, basically those male disconnects get plugged into the relay board instead of the relay, then you plug the relays into the added interlocking sockets, with pin 85 wired to the switch to manually override the fans? It would be great if there was a way to clean up all the male disconnects, but it doesn't look like anyone makes a male relay plug, unless you want to gut a standard relay. Last edited by rick3000; 05-05-2016 at 04:21 PM. And yes, that's exactly it, you plug the quick disconnect terminal instead of the relays. 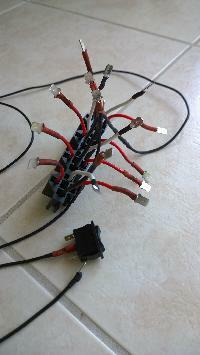 and the relays into the interlocking sockets. 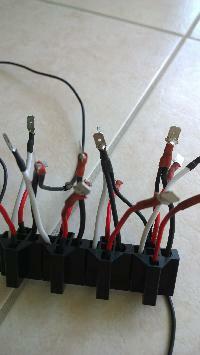 I have to get a glue gun so I can lock the wires inside the sockets once for all. I really love this, my 986 does not like the summer heat, so I will probably do this. Although I may just use fuse taps (a slighter fancy solution than wrapping a wire around the pin), then see if I can wire it to an OEM switch. I still have two button blanks to fill. The problem with using the OEM switches is that they are one stable position, not 3 like the one I use, so to have control for high and low speed, you'd have to use to more relay and two switches! I just went to it to view the pic, no issues. I clicked the pic to get a closeup and it opened in a new tab. When I closed it, it took me back to the original tab, which now had a selection of lovely ladies for me to choose from... Luckily they were SFW. Ahah, did you choose one? It's weird it always works with me... maybe adblock is blocking the pop-ups efficiently!